Searching for a Costa Blanca property? You’ve come to the right place! The Costa Blanca, or White Coast, stretches for 170 miles along Spain’s East coast – from Gandia in the North to Murcia in the South – with the city of Alicante marking a rough halfway point. There is a fantastic selection of cheap villas, houses and apartments for sale on the Costa Blanca, plus it has more Blue Flag beaches than any other Spanish Costa – a guarantee that they are clean, unpolluted and safe for all the family. The Costa Blanca is a cosmopolitan and varied place to live: as well as stunning beaches there are dramatic mountains, lush valleys, breathtakingly pretty villages with white-washed houses, modern resorts, golf, water sports, fiestas and festivals, history and culture, food and wine. Tourism and development are concentrated on the coast – a short drive inland reveals peaceful villages, small rural towns and gorgeous, unspoilt countryside, with the excellent road network making it simple to get around. It takes around 2 hours to fly to the Costa Blanca from the UK. Alicante Airport, being midway along the coast, is ideally located for easy access to North and South Costa Blanca. With so many airlines operating services to Alicante – Iberia, Easy Jet, Ryanair, bmi and bmibaby, FlyBe, Air Europa, Jet2, Air Berlin – plus all the usual charter airlines – it’s easy to shop around and get a good deal on flights. Murcia San Javier Airport is handy for the Orihuela Costa, and Valencia Airport is a possible alternative to Alicante if you are travelling to Denia / Marina Alta. For more detailed information about Alicante and property for sale on the Costa Blanca, check out the Official Costa Blanca Tourist website. Costa Blanca North – Head north from Alicante airport, and the terrain is more lush and mountainous. Olives, lemons, oranges, almonds and cherries are cultivated here on terraced hillsides and exported worldwide. This part of the Costa Blanca is less developed than the southern end – with building heights and density strictly regulated in many of the towns. From larger resorts like Calpe to small market towns like Benitachell and Pedreguer, this charming part of the Costa Blanca has something for everyone. Particularly popular with walkers and hikers, there are twenty natural parks and a mix of sand and pebble beaches. Costa Blanca South – Less dramatic than the Marina Alta and the northern stretches of the Costa Blanca, the southern towns are perhaps a more typically Spanish coastline – flatter and more arid as you head towards Murcia, with miles of sandy beaches, palm tree forests and salt lakes. There is a bigger expat population in the South – particularly around places like Torrevieja, Playa Flamenca and Villamartin. Golfers are spoilt for choice here – with numerous top class, championship courses to choose from. The array of property for sale on the Costa Blanca is immensely varied. There is something to suit all requirements and budgets, with an excellent selection of cheap property for sale, as well as luxury villas and apartments at the top of end of the market. There are plenty of new developments – gated and golfing communities – and also a large variety of bargain re-sale properties. 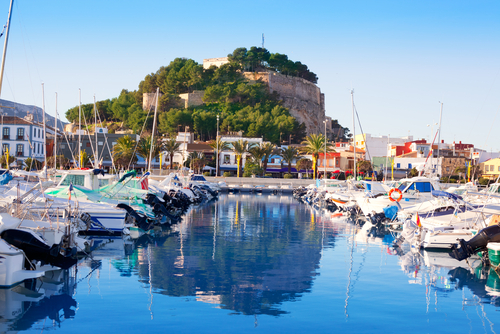 For investment potential, the Costa Blanca is hard to beat. If you are considering buying to let, 12 months of sunshine and the family appeal of the region make year-round rental a real possibility. Property For Sale Costa Blanca: HomeEspaña has properties throughout the Costa Blanca, from secluded rural villas to town apartments. Our lists are frequently updated, helping you understand the local market and make an informed decision when buying any type of property on the Costa Blanca.